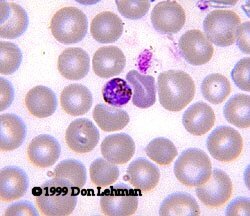 Plasmodium malariae prefer to infect older RBCs, thus limiting the parasitemia. 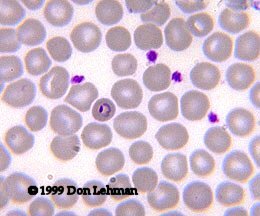 The ring forms resemble those of the other Plasmodium spp. 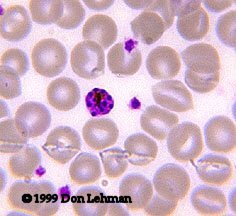 With P. malariae, infected RBCs are about the same size as uninfected cells. 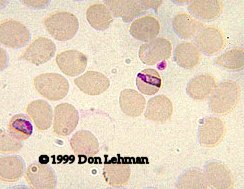 A key diagnostic feature of P. malariae is the presence of band forms (at left); these are trophozoites that stretch across the RBC. Mature shizonts (lower left) have between 6-12 merozoites. The gametes (lower right) resemble those of P. vivax.